A collection of some of Princess Diana‘s most memorable evening gowns, including one she wore to a White House dinner where she danced with John Travolta, fetched over 800,000 pounds ($1.2 million) at a London auction Tuesday. 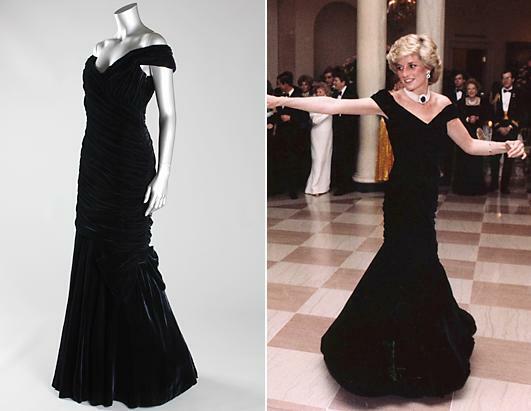 Diana famously wore the deep navy, figure-hugging velvet gown to a gala dinner hosted by President Ronald Reagan, during her and Prince Charles’ first joint state visit to the U.S. in 1985. Photographs of her taking to the White House dance floor with Travolta have become some of the most celebrated images of the princess. The Victor Edelstein gown was sold for 240,000 pounds, Kerry Taylor Auctions said. It came slightly below the expected maximum price of 300,000 pounds. Nine other of Diana‘s dresses were sold to bidders, which came from around the world and included three museums, the auction house said. Two dresses by Catherine Walker, one of Diana’s favorite designers, went for 108,000 pounds each. They were a black velvet and beaded gown worn for a Vanity Fair photo shoot by Mario Testino at Kensington Palace in 1997, and a burgundy crushed velvet gown the princess wore to the film premiere of ``Back to the Future‘’ in 1985. 다이애나 공주 드레스 얼마에 팔렸나? 다이애나 공주의 이브닝 가운들이 옥션에서 80만 파운드 넘게 책정되어 팔렸다. 존 트라볼타와 백악관에서 춤출 때 입었던 드레스도 물론 포함되어 있었다. 다이애나의 유명한 남색 가운은 로널드 리건 대통령이 주최한 갈라 디너에 입고 간 드레스로 유명하다. 이 날 백악관에서 춤추면서 찍힌 사진은 유명하다. 빅터 에델스타인 가운은 24만 파운드에 팔렸다고 케리 테일러 옥션이 전했다. 옥션 하우스는 이 다이애나 공주의 드레스를 구매한 사람에 대해 “부인을 놀라게 해줄 영국 신사”라고만 밝혔을 뿐 자세한 사항은 밝히지 않았다. 다이애나의 다른 아홉개의 드레스는 각기 다른 사람들에게 팔렸다고 전했다. 구매자들은 모두 다른 나라에서 온 사람들로 박물관 세 곳도 있었다고 밝혔다. 다이애나가 가장 선호하던 디자이너인 케서린 워크의 드레스 두벌은 각각 10만8천 파운드에 팔렸다..